The uniqueness of all the students and schools I work in. As a long-term sub, I enjoy witnessing the growth of every student in the class. I’m currently looking for a full-time job in a district which matches my beliefs of education. I have worked in Special Education (from autism to learning disabilities) and have been a math interventionist for 4 years. I enjoy grades 2-4, but am currently expanding out and tickled to be currently in a kindergarten classroom. I do not have a favorite subject as I tend to have fun with any topic! The fun activities I try to include for classroom management and the positivity I spread to all the kids. I’m currently taking classes through Baker University to receive my master’s in school leadership. I just began the law portion and I wonder what I got myself into! When I do have free time, I enjoy watching my niece and nephew in their sporting events and I am a huge football fan. I also love to garden and paint on canvas. I have been married for 15 years and live in Lawrence. We enjoy going on jeep trails, rock climbing and have been sightseeing in Colorado and Moab. My husband and I have one dog, a boxer who we raised from a little pup. He definitely keeps us on our toes. I have been a Deputy Sheriff for Douglas County. Through this employment, I met my husband who is still employed there. During my employment, I attended different trainings focusing on child safety. 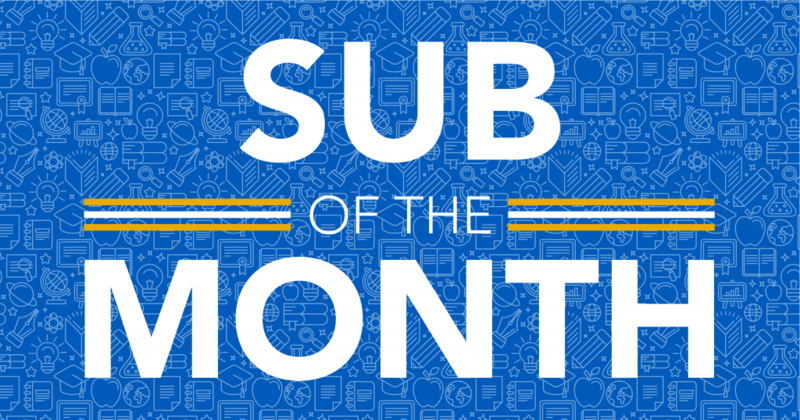 We chose Kim Stieben as our October sub of the month because she is always eager and willing to work, and despite any challenges that arise in the classroom, she always has a positive attitude/outlook. Kim began the school year in a long-term position and has recently jumped into another last-minute long-term that came up. We appreciate all that you do for our schools, Kim!